I once heard someone say about religion that, “you can be right about everything, but if you’re wrong about Jesus, you’re wrong”! Certainly, the bible backs this up. Jesus Himself asked the question, “Who are men saying the Son of man is”? Well, Muslims say that Jesus was a great prophet; Buddhists say that Jesus was an exceptional man who attained perfection; Mormons believe Jesus is our elder spirit brother and the Jehovah’s Witnesses teach that Jesus was really the Archangel Michael. All these different teachings are enough to drive someone crazy. So, will the real Jesus please stand up? Although there are many different Jesus' (2 Co. 11:4), the focus of this article will be to research the identity of Jesus as taught by the Watchtower Bible and Tract Society. Since the Watchtower doesn't believe that Jesus was a prophet, a new age guru, God in flesh or a self-appointed philanthropist, He has to be somebody. Therefore, the Watchtower came to the conclusion that Jesus, the Son of God, is the Archangel Michael. 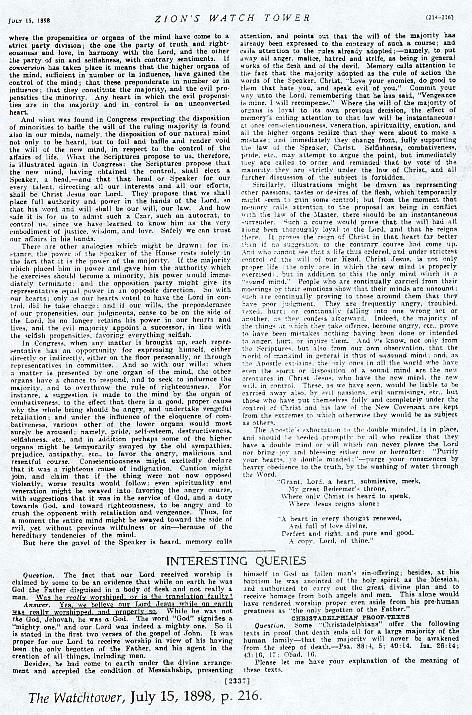 Hence, The Watchtower, February 15, 1979, p. 31 says that Jehovah's Witnesses believe the Son of God to be, "Jesus Christ, whom we understand from the scriptures to be Michael the Archangel". 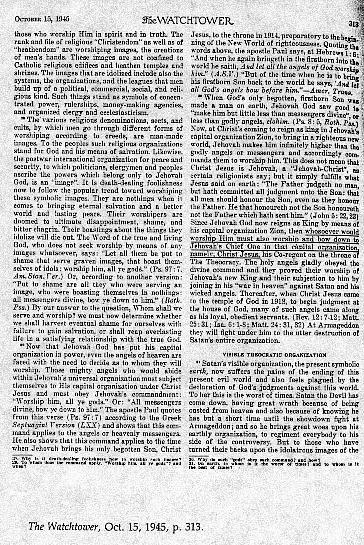 Also, according to The Watchtower, Dec. 15, 1984, p. 29, "Michael the great prince is none other than Jesus Christ himself". Since the identity of Jesus is such a critical teaching, can we be sure that the Watchtower is correct? Let's review and see. First, has the Watchtower always taught that Jesus Christ is the Archangel Michael? Actually, the first president of the Watchtower, Charles Taze Russell, can answer that for us. He wrote in The Watchtower, November 1879, p. 4, “Hence it is said, ‘Let all the angels of God worship him’: (that must include Michael, the chief angel, hence Michael is not the Son of God)....”. So history proves that the early Jehovah’s Witnesses did not believe that Jesus and Michael were the same person. A modern Jehovah’s Witness will be quick to point out Proverbs 4:18 which says that the light is getting “lighter and lighter”. This verse is used often (and out of context) by Jehovah’s Witnesses when defending the Society’s many doctrinal changes. But, when one thinks about it, the switch from Jesus not being Michael, to Jesus being Michael is not a situation where light has increased. It is a circumstance where light has remained the same, but changed radically. Pastor Russell explained this concept accurately in Zion’s Watch Tower, February, 1881, where he said, “A new view of truth can never contradict a former truth. ‘New light’ never extinguishes older ‘light’, but adds to it....So is it with the light of truth; the true increase is by adding to, not by substituting one for another”. Secondly, this Watchtower teaching causes a major problem. If Jesus is the Archangel Michael, like Jehovah’s Witnesses believe, is the entire angelic realm guilty of idolatry? Or worse yet, is the Father guilty of making the angels worship another angel? 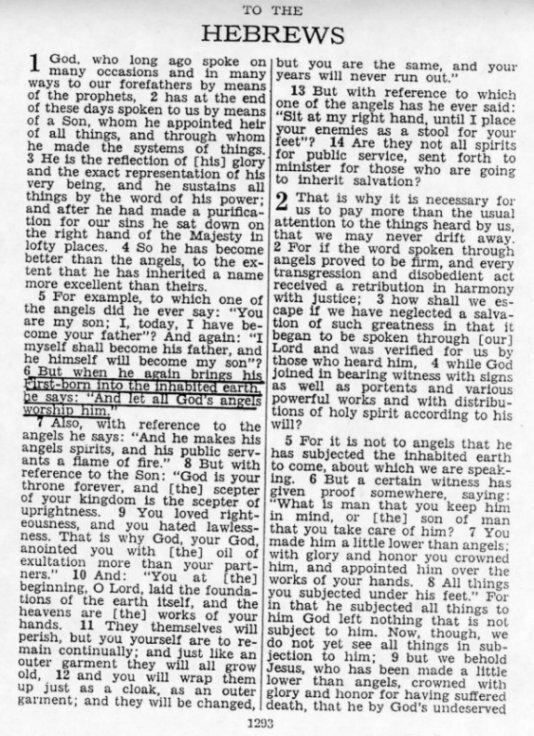 After all, the New World Translation of the Holy Scriptures, revised in 1970, renders Hebrews 1:6 as, “But when he again brings his First-born into the inhabited earth, he says: ‘And let all God’s angels worship him’” (italics mine). This Greek word for worship, proskuneo, is the same word that is used in reference to worshipping Jehovah God. See Mt. 4:10, 1 Co. 14:25, Rev. 4:10. Also eye opening is the comment in The Watchtower, 10-15-45, p.313, which says, “....whosoever should worship Him must also worship and bow down to Jehovah’s Chief One in that capital organization, namely, Christ Jesus....”. 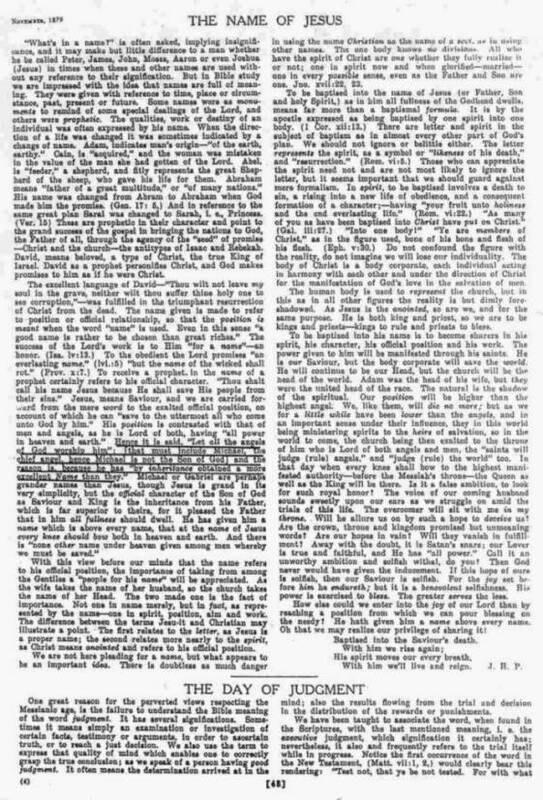 This supports the earlier Zion’s Watch Tower, July 15, 1898, p. 216, where the question was asked, “Was he really worshipped, or is the translation faulty? Answer. Yes, we believe our Lord Jesus while on earth was really worshipped, and properly so”. So then, was Jehovah pleased with older Witnesses who were taught to worship Jesus? Were they to blame of a serious sin? It wasn’t until 75 years after the Watchtower’s inception that the doctrine of rendering worship to Jesus was reversed. 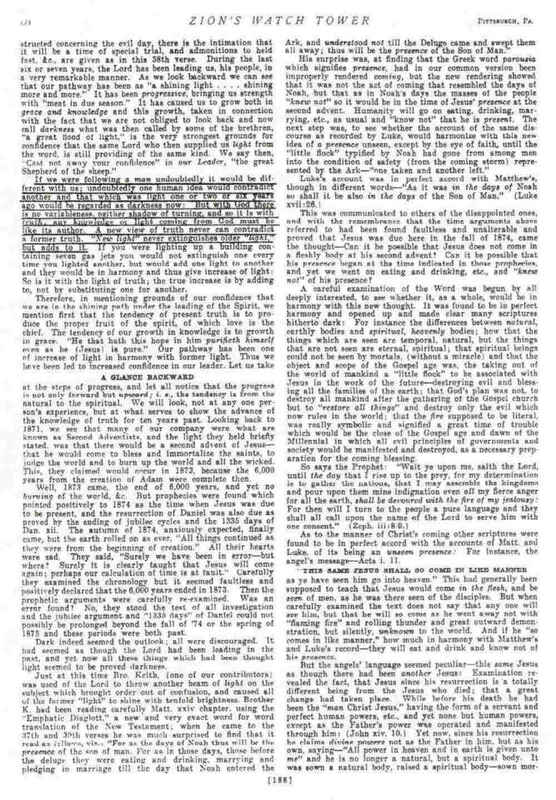 See The Watchtower, January 1, 1954, p.31. Thirdly, if Jesus (or Michael) is the first and greatest creation of Jehovah according to Watchtower teaching, why does Daniel 10:13 call Michael, “one of the foremost princes”? This verse put Jesus on a level equal to other angels. And how can an angel will himself out of existence, become a man and then become an angel again when Hebrews 13:8 says, “Jesus Christ is the same yesterday and today, and forever”? Wouldn’t this be a violation of the text? So we see that the Watchtower Bible and Tract Society’s strange teaching about Jesus being Michael is not built on a solid foundation. We certainly have free will to believe what we want about the identity of Jesus Christ. However, our eternity rests on the decision we make (John 8:24). The best way to find out who Jesus really is is to read the bible and see what He said about Himself, and what others said about Him. It’s amazing what great truths we can uncover in the bible when we read it on our own, without clouding our thinking with extra biblical literature. I encourage you to do just that. As for the real identity of Jesus, why don’t you let the Holy Spirit tell you? Jesus did say, “When the helper arrives that I will send you from the Father, the spirit of truth, which proceeds from the Father, that one will bear witness about me”. John 15:26.